The Chris Craft 425 has a reputation for sturdy construction and a well arranged interior. The spacious sun deck, salon with 360 degree views, functional galley and walk around queen berths make her a great long range cruiser or liveaboard. “The Oblivion” is a single owner boat that was repowered with Cummins Diesel engines in 1998 along with other mechanical upgrades over her lifetime. The owners have retired from boating and she awaits her next owner to spruce her up and set a course for new adventures. West Florida Yachts would love to guide you through a personal showing of this 42' Chris-Craft 425 Catalina 1985. 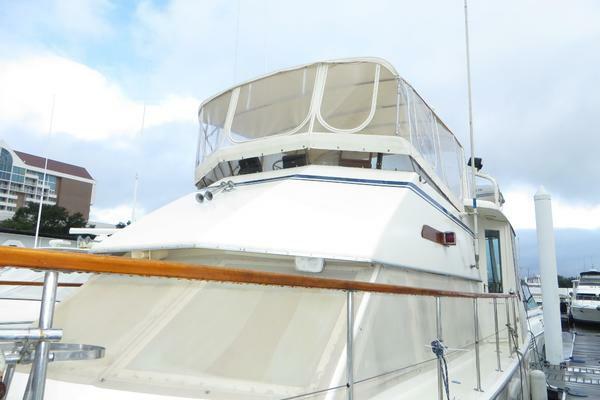 This yacht for sale is located in Essex, Maryland and priced at $29,500. For a showing please contact us by filling out the form on this page and we will get back to you shortly! The Chris Craft 425 has a reputation for sturdy construction and a well arranged interior. The spacious sun deck, salon with 360 degree views, functional galley and walk around queen berths make her a great long range cruiser or liveaboard. ?The Oblivion? is a single owner boat that was repowered with Cummins Diesel engines in 1998 along with other mechanical upgrades over her lifetime. The owners have retired from boating and she awaits her next owner to spruce her up and set a course for new adventures. Entering from the port or starboard side deck the sundeck extends across the stern of the boat. There is plenty of space available here for entertaining in this bright and airy section of the boat. The sun deck is open to the fly bridge forward, with a large salon picture window underneath. To the right of this is a clear plexiglass door opening to the stairs into the salon. The staircase to the flybridge is to the right of the door. The deck is enclosed by a stainless steel railing with hard panel inserts and is protected from the sun by a hard top, that features two overhead swivel lights at the stern, port and starboard. The full beam swim platform is accessed via a ladder found at a center mounted gate in the stern rail. Moving up four steps to the flybridge the helm is found forward, where the wheel and instrument panel is center mounted on top of the forward coaming console. A storage area under the coaming console is accessed by double doors, port and starboard with a foot rest in between. Captain and first mate swivel chairs complete the helm are. Additional seating for 5 is provided by an L-Bench, extending along the port side and across the port aft section of the fly bridge. A solid coaming surrounds the flybridge on three sides, with the aft open to the sundeck below, and topped with a radar arch featuring two deck lights and an anchor light. The fly bridge is protected from the sun and elements by a plexiglass wind screen and a Bimini top with canvas-eisinglass curtains (not pictured). Accessed by a center mounted ladder leading to the sundeck, the full beam swim platform features dinghy davit mounts and a retractable swim ladder at the port corner. There is a hand hold on the port side and an outboard engine mount affixed to the port side of the ladder. One step down from the sundeck, the side decks and bow are enclosed by a stainless steel railing that is open mid-ship just forward of the sundeck to allow access to the vessel. Stainless steel hand holds are mounted on the flybridge coaming. A pulpit at the bow features an integrated anchor mount and electric windless, with a chain port leading to the chain locker below. The bow is completed by a central raised deck that includes an opening hatch to the cabin below a solar fan vent and galley ventilation port. 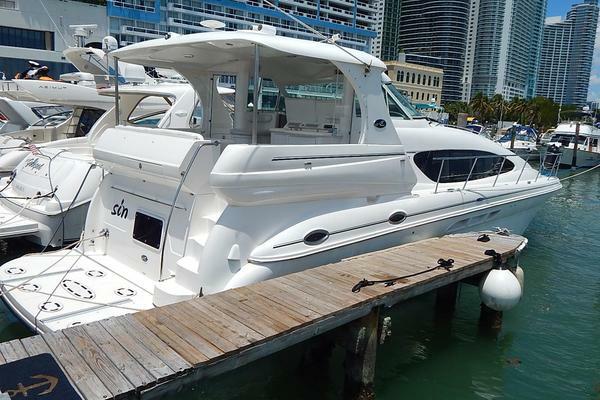 A search light, signal horn and hailing horn are front mounted on the flybridge coaming. The salon is entered from the sundeck four steps down and features teak paneling and joinery throughout, a carpeted deck and large windows with blinds and curtains, providing 360 degree views. A L-shaped sofa, which converts to a double berth, is found aft and to port, with a swivel arm chair opposite to starboard. Half-length teak cabinetry and shelving are located forward, separating the salon from the dinette and galley area, which are open to the salon above and entered by a center mounted staircase. Access to the aft stateroom is accessed by a companionway at the aft starboard side. The electrical panel is found on the starboard side of the companionway. Three steps down from the salon the dining area is found to port and features a large U-shaped settee with pedestal table, providing seating for up to six. Storage lockers run along the port side and aft between the area and the salon. Additional storage can be found under the settee. Teak joinery and cabinetry is found throughout, including a teak parquet sole. The galley is entered three steps down from the salon, opposite the dining area. It is L shaped, running along the starboard side and then extending midship, which creates a separation from the salon. The galley features a full size over/under refrigerator/freezer, a stainless steel double sink with hot and cold running water, a 3 burner electric stove/oven, and an over-counter microwave. With teake joinery throughout, there are multiple lockers, drawers and shelves for storage. The deck is teak parquet, with storage underneath. The private forward stateroom is entered by and inward swinging door from the galley area. It features a centerline queen berth, sink area w/mirror to starboard, and a private head and a hanging locker to port. Additional storage drawers are found under the berth. There is an opening hatch overhead and two opening portlights. Shelving runs along the hull sides port and starboard, with a mirror mounted on the forward bulkhead. The deck is carpeted. The aft stateroom is found three steps down via a companionway in the aft starboard corner of the salon. The full beam stateroom features a center mounted, queen berth and ensuite head. Teak trimmed shelving and drawers run along the starboard side, with a vanity on the port side, along with additional drawers and lockers. Additional storage is provided by a two hanging closets, one located on the forward bulkhead, the second in the forward starboard corner of the cabin. Light and ventilation are provided by two large opening portlights at the stern and windows running the lengths of the cabin, port and starboard. All are covered with a wrap around valance and curtains. The ensuite head is found on the port side forward. The decks are carpeted. The ensuite head features a sink and countertop with hot & cold running water along the port hull, with a bath tub shower to the right and a marine head to the left. A mirror topped by a window w/curtains above runs the length of the countertop. An additional mirror is mounted on the forward bulkhead next to the sink. Storage lockers can be found underneath the sink and countertop. The private forward head is found in the forward stateroom opposite the sink area. It consists of a marine head with shelving behind and an in-head shower. The engine room accessed through hatch doors in the salon deck. sun deck, access to the boat is found between the railing and the sundeck.